This IBM® Redbooks® publication for the Tivoli® Storage Productivity Center for Replication for the Open environment walks you through the process of establishing sessions, and managing and monitoring copy services through Tivoli Storage Productivity Center for Replication. The book introduces enhanced copy services and new session types that are used by the latest IBM storage systems. Tips and guidance for session usage, tunable parameters, troubleshooting, and for implementing and managing Tivoli Storage Productivity Center for Replication’s latest functionality up to v5.2 also are provided. Tivoli Storage Productivity Center for Replication’s integration and latest functionality includes Global Mirror Pause with Consistency, Easy Tier® Heat Map Transfer, and IBM System Storage® SAN Volume Controller Change Volumes. As of v5.2, you can now manage z/OS® Hyperswap function from an Open System. IBM Tivoli Storage Productivity Center for Replication for Open Systems manages copy services in storage environments. Copy services are used by storage systems, such as IBM System Storage DS8000®, SAN Volume Controller, IBM Storwize® V3700, V3500, V7000, V7000 Unified, and IBM XIV® Storage systems to configure, manage, and monitor data-copy functions. Copy services include IBM FlashCopy®, Metro Mirror, Global Mirror, and Metro Global Mirror. This IBM Redbooks publication is the companion to the draft of the IBM Redbooks publication Tivoli Storage Productivity Center V5.2 Release Guide, SG24-8204. It is intended for storage administrators who ordered and installed Tivoli Storage Productivity Center version 5.2 and are ready to customize Tivoli Storage Productivity Center for Replication and connected storage. 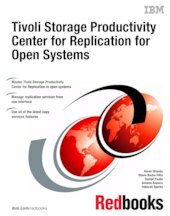 This publication also is for anyone that wants to learn more about Tivoli Storage Productivity Center for Replication in an open systems environment.